Owning or managing a commercial or multi-family property in White Rock is a massive responsibility all year round. Maintaining a safe and welcoming environment takes up a lot of time and effort. So, when winter rolls around and the need for White Rock Snow Removal and Salting arises, why not take a weight off and call in the professionals. Winter weather in White Rock can be fickle. Constantly watching for frost and snow warnings takes up time better used elsewhere; and not many people enjoy the late nights and early mornings involved in Salting and Snow Removal. All it takes is one missed temperature drop and the safety of your customers and/or residents is in jeopardy. Most slips and falls on ice result in minor bumps and bruises; however, every year, thousands of people are hospitalised due to more serious injuries. When you implement Gorilla Property Services Salting and Snow Removal this need never concern you again. We watch the weather for you, prepared to dispatch our fully trained and licensed Gorillas at the first sign of frost and/or snow. 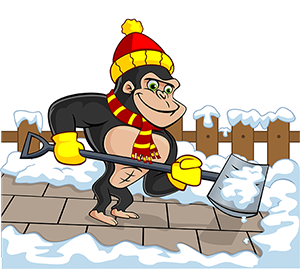 Our Gorillas show up professionally uniformed and fully equipped to tackle any Salting and Snow Removal head on. Exposed common areas are thoroughly salted the night prior to expected winter weather. Need your parking lot salted? Not a problem, with our ‘Gorilla Mobile’. While White Rock is better known for sunshine than snow, as a property owner or manager, it is best to be prepared. On the rare occasion that White Rock sees snowfall our Gorillas are back on site in the early hours to remove all traces. The majority of our snow removal service is carried out by hand with shovels. This keeps the noise down and ensures all necessary areas are checked and fully serviced.